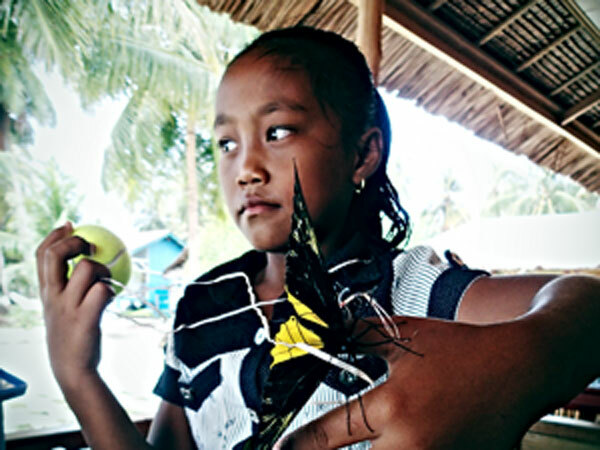 This is Irva, aged 10, the little swimming star who also keeps butterflies as pets! Three months ago Irva could hardly swim and entered the water with trepidation and uncertainity. Now there is no stopping her; the enjoyment she derives from her liquid environment is clearly evident. She even smiles when she has to breathe! Starting using a kick float to aid buoyancy and achieve a good body position on the water facilitating an effective breathing technique really helped Irva, along with a pair of goggles! Irva now views the ocean is a very different way, not as something unknown and to be feared but as a playground and source of fun. This is a real achievement for a girl from a village where none of the older women enter the water or interact in the aquatic environment on their doorstep. Using goggles has also opened up the mesmerising underwater world to Irva. Brightly coloured corals and many species of kaleidoscopic reef fish are found in the shallows here and Irva loves checking them all out – sometimes so much so that she forgets what she is doing and swims off enthralled by the underwater show. This is fantastic. Not only does it illustrate her confidence in the water and how at ease she feels, but she is seeing what lives there, interacting with it which sparks an interest. Hopefully this fascination combined with an increasing affinity for swimming will lead Irva to develop a long-lasting relationship with the ocean, for her and it’s benefit.